If, like me, you thought 3D began and ended with Freddy's Dead: The Final Nightmare and those red and green Jaws pics on the back of old Weetabix boxes, then, in the words of Judas Priest, you've got another think coming. 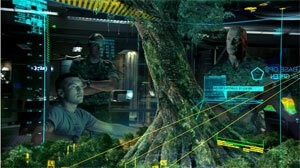 Avatar is the first full length film I've seen in 3D and it is simply stunning. As our hero, Jake, slips into his avatar body and steps into the lush, mysterious forests of the alien planet Pandora, he's like Dorothy landing in Oz and walking from black and white into colour. Forget pitchforks pointed in your face and eyeballs flying out atcha: here flowers burst into glorious Technicolor bloom, ferns unfurl invitingly towards you and the cinema is filled with delicate, floating seeds. As for the CGI – if Terminator 2 had your jaw dropping to the floor, then, in the words of Bachman Turner Overdrive, you ain't seen nothing yet. James Cameron has been waiting years for technology to catch up to make his vision for Avatar a reality and, as far as the look of the film is concerned, it's been time well spent. A shame, then, that while he was waiting, he couldn't have come up with a better plot, instead of a half-baked children's fantasy in which Dances with Wolves meets Disney via a The Happening-style eco revenge plot. Hmm. And while the film's somewhat laboured message – that 'civilised' people have a lot to learn from weird-looking natives and that everything in nature is, like, connected, man, and should be, you know, respected – may have been original(ish) a few years back, it's starting to feel hackneyed now, delivered with a preachy intensity that makes Happy Feet look subtle. For a rollercoaster ride of a film and a beautiful, arresting, truly imaginative visual experience, I highly recommend Avatar (although how good it'll look in five years time, when episodes of Hollyoaks will probably be made in 3D, is anyone's guess). But for a plot you won't pick holes in and characters you can believe in, I'd wait for Peter Jackson or Guillermo del Toro to go 3D. 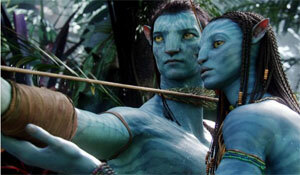 Virtually perfect visually, in reality, Avatar is a bit of a let down.